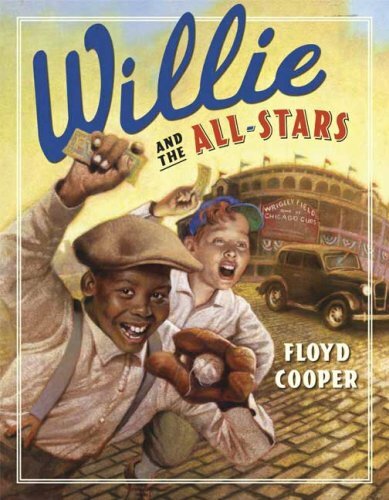 In honor of Jackie Robinson Day — the anniversary of his debut in major League baseball — I’d like to share this review of an appropriate children’s picture book — Willie and the All-Stars (written and illustrated by Floyd Cooper). Even young Willie’s baseball is made out of string and tape, and he lives alone with his grandma in “a tiny one-room apartment on the North Side of Chicago.” But on his grandmother’s radio, he listens to the baseball games at Wrigley Field, and dreams about someday hitting a home run of his own. Even when he’s running to the store, he imagines he’s stealing bases! Unfortunately, in 1942 it takes more than talent for a boy to grow up to be a Major League baseball player. “It’s also about the color of his skin,” explains an old man in Willie’s neighborhood. Later Willie talks to his friend – a white Irish boy who has the same dreams. “Ol’ Ezra tells me I ain’t never gonna play in the Majors,” Willie says. “You don’t know that for sure,” his friend replies. Willie watches a game – but what inspires him even more is how when it’s over, two players from the opposing teams dared to walk to the pitcher’s mound, shaking hands in a show of acknowledgement. Then the story ends abruptly, though the book’s next page still adds in some extra significance. “Who knows how many dreams were kindled by their determination?” the author writes at the end of the author’s note. Though the real happy ending to this story obviously lies in the history of professional sports. Major League baseball was integrated in 1947….